When Chevrolet unveiled their new Corvette sports car in 1953 Ford executives realized they would need to do something and the obvious thing would have been to create a Ford sports car that would directly compete with the Corvette. But the executives at Ford examined the potential market for such a car and decided that the sports car market was just too specialized a niche market. Ford’s decision makers therefore decided not to go after the Corvette head to head but to create something that would be more desirable to more customers. So they invented a whole new genre of car, the personal luxury car. The Ford Thunderbird was created as a personal luxury car yet with some credible sports car attributes. This 1957 car features the re-styled dashboard with round gauges. Ford pulled out the stops when it came to development of the Thunderbird and as a result the new car was ready to be shown at the Detroit Auto Show which began on 20th February 1954. This was not a car that sought to directly compete with the likes of the Chevrolet Corvette, nor with the British and European imports such as the Austin-Healey 100 and the Jaguar XK120 and XK140. This was a car that offered what many if not most buyers of sports cars want, comfort and prestige laced with the street cred provided by a powerful engine. This is exactly what the Ford Thunderbird served up. 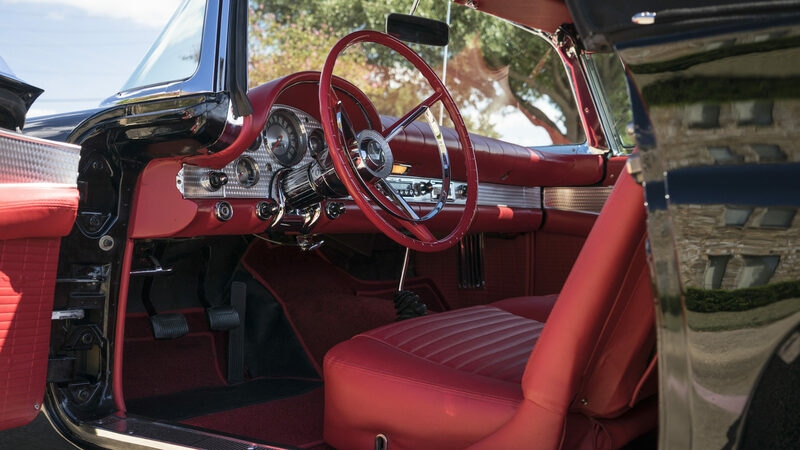 The interior of the Thunderbird was made to exude comfort and quality with a hint of European influence. The wrap around engine turned dashboard of the 1957 model having a hint of the jeweling of the bolt of an expensive American hunting rifle. Ford’s new personal luxury car, the Thunderbird, was fitted with a suitable V8 engine from the outset. Initially the Ford Thunderbird was fitted with the Ford Mercury 4.8 liter (292 cu. in.) Y block V8 engine sitting in a shortened 102″ wheelbase frame. The formula paid off and in its first year of production the Ford Thunderbird sold 16,155 cars compared with the Chevrolet Corvette which sold 700. Ford’s decision-makers had guessed right. For the 1956 model year Ford went for the obvious improvements. The engine size was increased to 5.1 liters (312 cu. in.) and power increased to an ample 215hp for the three speed manual version of the car and 225hp for the Ford O Matic two speed automatic transmission model. The 1956 model was also given a spare wheel located at the very back of the trunk and the weight of this spare hanging out at the very back of the car did absolutely nothing for the car’s handling. It was a feature that was corrected in the 1957 model. With its continental influenced styling the Ford Thunderbird looked like a car that could take on a Corvette and match it. For the 1957 model year Ford lengthened the rear of the car and re-located the spare tire laid down and just behind the rear axle, which fixed the handling problems created by the 1956 model’s arrangement. The big 5.1 liter V8 engine morphed into something even more powerful churning out 245hp and the speedometer went all the way up to 150mph which would certainly have made a few potential buyers think seriously about what might be possible. Ford were happy to oblige the customers looking for a bit of extra power and created a version of the car fitted with two four barrel Holley carburettors sending a healthy increase to the back wheels but to really create a Thunderbird that would be a Corvette killer Ford created the limited production F-Bird which was fitted with a Paxton-McCulloch VR57 supercharger added to a four barrel Holley enabling that 5.1 liter V8 to send 300hp to the rear wheels. The end result of this was that this F-Code Thunderbird could deliver a standing to 60mph time under six seconds and a top speed around 130mph. This was a car that would make Corvette owners sit up and take notice, in fact this was a car that could hold its own with some of the premium European imports. 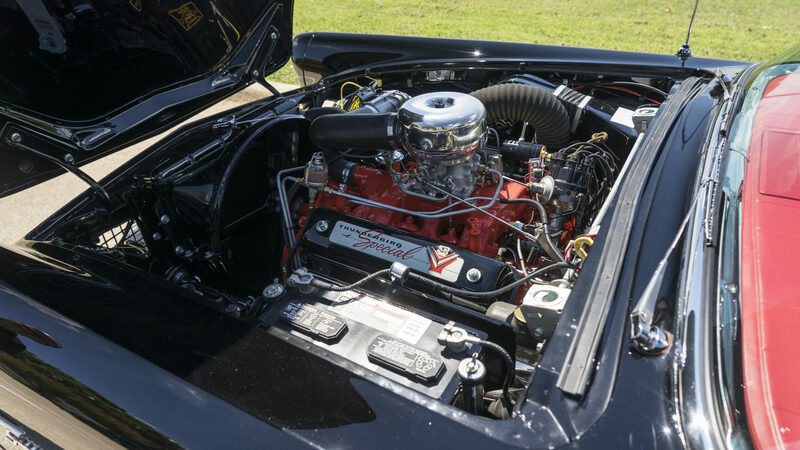 With the Paxton-McCulloch VR57 supercharger the F-Code Ford Thunderbird was capable of around 130mph. 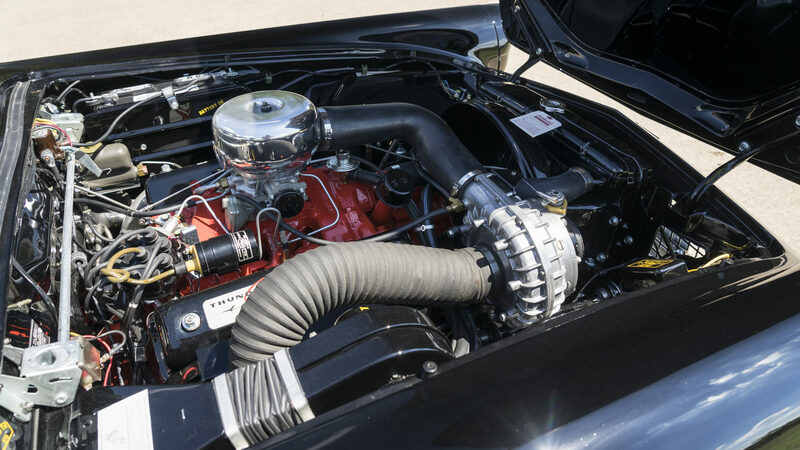 The Ford Thunderbird F-Bird’s list of engine modifications includes lower compression cylinder heads for the supercharger and revised camshafts. The car became a “personal luxury car” with an ample serving of neck muscle straining acceleration. This is the view most people would have of the Thunderbird F-Bird; the rear of the car as it passed them. 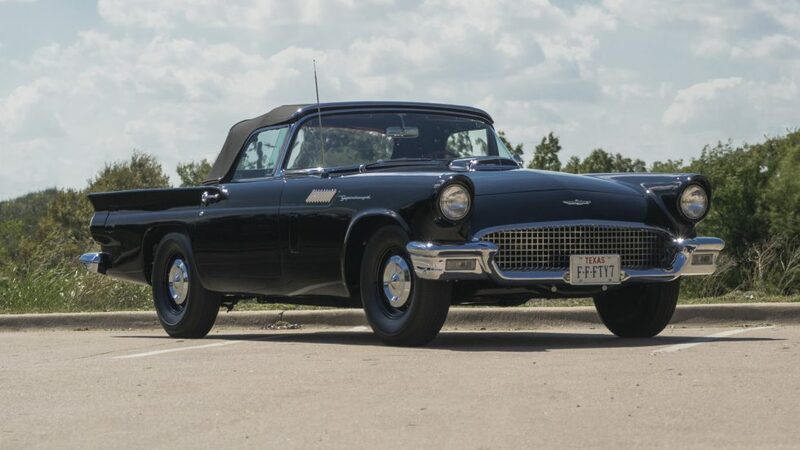 Only seventeen supercharged Ford Thunderbird F-Birds with the three speed racing gearbox were built in the 1957 model year and the black Thunderbird in our pictures is one of those original cars. It is coming up for sale by Mecum Auctions at their Dallas, Texas sale to be held over 2nd-5th November 2016. This represents an opportunity to acquire an example of one of the most important American car designs of the twentieth century. A car that defined a whole new genre of automobile and a car that made its mark in popular culture such as the Beach Boys song that says “She’ll have Fun fun fun ’til her daddy takes the T-Bird away” and tells us that “She makes the Indy 500 look like a Roman chariot race now“. This is an iconic American Muscle Car and you’ll find the sale page for it if you click here. 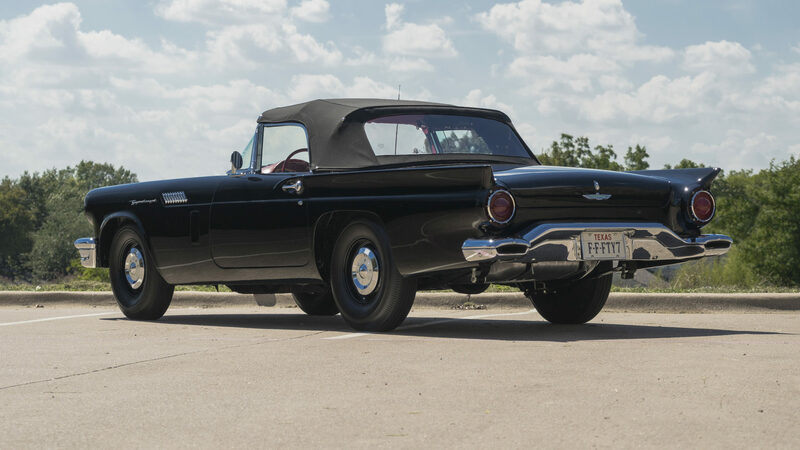 This F-Bird is expected to sell in the region of a quarter of a million US dollars on up. 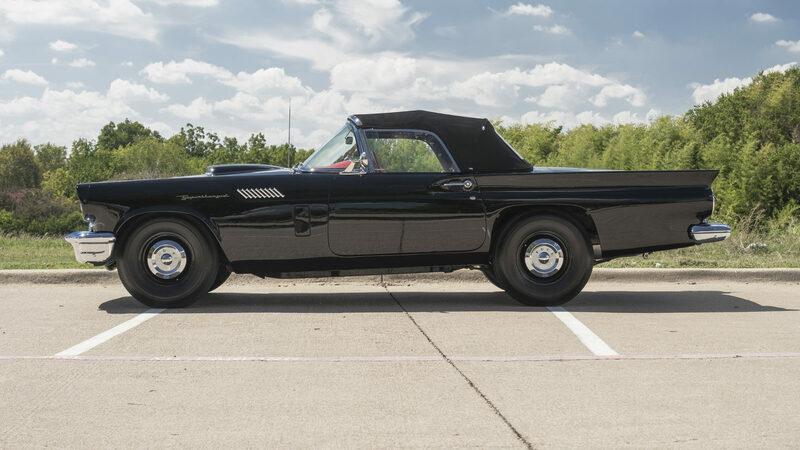 Just seventeen supercharged Thunderbirds were made by the factory with the racing three speed gearbox. (All pictures courtesy Mecum Auctions).